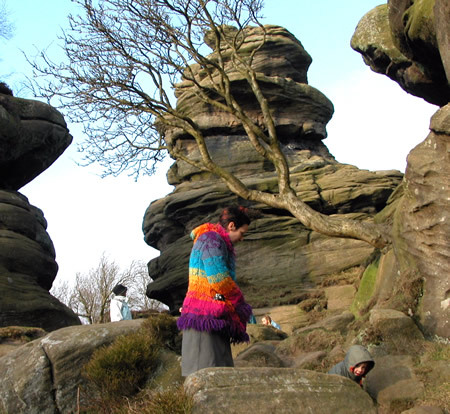 After a Dutch breakfast cooked by me, we had an afternoon up at Brimham Rocks. Have not been up there yet this year. It was really busy and they have started charging on the car park as early as Febuary now! (although who needs car parks when you know a sneaky spot to stash your wheels). It’s my favorite place in the world still I think. Prefer it at night, or when it’s quiet, bit it’s still a magical place. Eirene in her technicoloured dream coat.